The nucleus​ is a membrane bound structure that contains the cell’s hereditary information and controls the cell’s growth and reproduction. - It is the command center of a eukaryotic cell and is commonly the most prominent organelle in a cell. - The nuclear envelope is a double membrane that separates the nucleus from the cytoplasm. - The nuclear envelope is perforated with numerous pores called nuclear pores. - All traffic into and out of the nucleus passes through nuclear pores. Inbound traffic includes all nuclear proteins and ribosomal proteins destined for the nucleolus. Outbound traffic includes mRNAs and ribosomal subunits. - Chromosomes consist of DNA, which contains heredity information and instructions for cell growth, development, and reproduction. When a cell is “resting” i.e. not dividing, the chromosomes are organized into long entangled structures called chromatin and not into individual chromosomes. 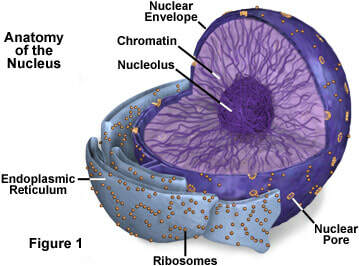 - The nucleolus is not surrounded by a membrane, its function is to synthesize ribosomes. The differences between chromatine and chomosomes. CHROMATIN : Loose form of genetic material & the “normal state” of DNA and RNA in the nucleus in the cells. CHROMOSOME : Condensed form of chromatin, Chromatin becomes chromosomes in the Prophase of Mitosis and Prophase I and Prophase II of Meiosis. 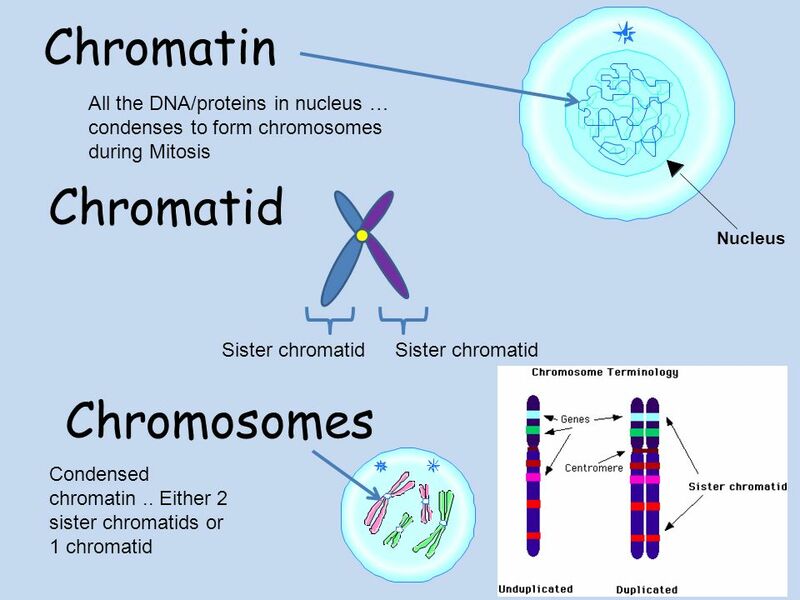 CHROMATID : Often known as “sister chromatids”, because the two sister chromatids in one chromosome are identical. The cell cycle is the period that goes from the moment the cell has just been formed (from the division of the mother cell into two), to the point where the same cell divides in two daughter cells. During the interphase the long filaments of DNA-protein complex called chromatin are spread through the nucleus. The proteins associated with the DNA are called histones. During all three phases of the interphase the chromatin is transcribing itself (therefore synthesizing RNA, mRNA). It is an active period. However, when the cell is getting ready to divide, the chromatin condenses into compactly folded and coiled chromosomes. 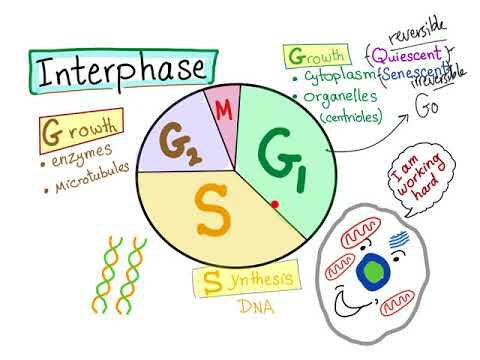 G1 phase is also known as First Growth Phase. During this phase, biosynthetic activities occur.. Cell synthesizes more proteins, increase the number of mitochondria and ribosomes. S phase is the phase where DNA is replicated. At the end of DNA replication, each chromosome is with two sister chromatids. 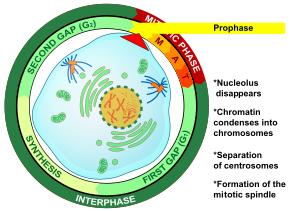 G2 phase is the phase where the cell prepare itself for mitosis. The second phase of mitosis is metaphase. During this step, the spindles are completely developed and the centrosomes are on opposite sides of the cell. 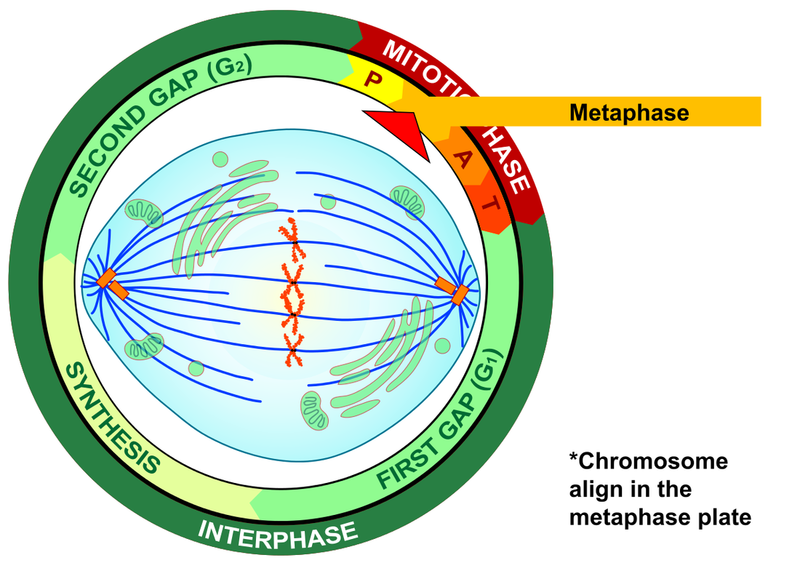 The chromosomes are lined up on the "equator" of the cell, also known as the metaphase plate. Remember how chromosomes are made of sister chromatids? Well, each of these sister chromatids is attached to a spindle from opposite sides of the cell. This is the most critical phase of mitosis as it must ensures an equal disrtibution of sister chromatids to each daughter cell. Spindle fibres are attached to the centromere, there are also unattached spindle fibres that work to elongate the cell. The attached spindle fibres then contract towards their pole. This causes the chromosome to break at the centromere and sister chromatids move to opposite poles of the cell. At the end of anaphase each pole will have a complete set of chromosomes. 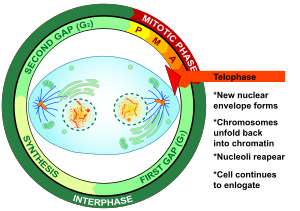 ​In telophase the chromosomes are at the poles and the nuclear membrane reforms to make 2 nucleoli. The chromosomes unwind back to chromatin. The centre of the cell begins to contract and the cell begins to physically separate into 2 new daughter cells. This is known as cytokenisis. Draw a labelled diagram of the cell cycle. Explain what happens during each stage of the cycle. 1.. Mitosis is when the cell divides. 4.. Checkpoints ensure the cell is working as it should. 5.. Cancerous cells go through the cell cycle more slowly than normal cells. 6.. Chemotherapy targets cells which divide rapidly. 7. Cells are in mitosis for about 90% of their lifetime. 8.. Cancerous cells do not go through the checkpoints of the cell cycle.